The history of what are now known as the Czech lands (Czech: České země) is very diverse. These lands have changed hands many times, and have been known by a variety of different names. 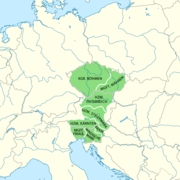 Up until the fall of the Austro-Hungarian Monarchy after the First World War, the lands were known as the lands of the Bohemian Crown and formed a constituent state of that empire: the Kingdom of Bohemia (in Czech: "Království české", the word "Bohemia" is a Latin term for Čechy). Prior to the Battle of Mohács in 1526, the Kingdom was an independent state within the Holy Roman Empire. After that battle the Lands of the Bohemian Crown were incorporated into the Austrian Empire, and later into the aforementioned Austro-Hungarian Monarchy. They came to be known as the Czech lands after the fall of the Empire, and the rise of the First Czechoslovak Republic, when the term Bohemia (Czech: Čechy), which also refers to the core region of the former kingdom, was no longer deemed acceptable by those in Moravia and Czech Silesia (historically, other two core lands of the Bohemian Crown). These three integral Czech lands (Bohemia, Moravia and Czech Silesia) now form the boundaries of the Czech Republic. Duchy of Bohemia under Boleslaus I. and Boleslaus II. Lands of the Bohemian crown until 1740. Early modern humans had settled in the region by the (Lower Paleolithic) (2.5mil – 750,000 BP). Several Paleolithic cultures settled here, including Acheulean, Micoquien, Mousterian, and Aurignacian. The Předmostí archaeological site near Brno is dated to between 24,000 and 27,000 years old. The figurines (Venus of Dolní Věstonice) found here are the oldest known ceramic articles in the world. The area was settled by the Celts (called Boii, who gave the name to the region: Bohemia, which means more or less "the home of the Boii") from 5th century BCE until 2nd century CE and from 1st century by various Germanic tribes (Marcomanni, Quadi, Lombards). Germanic towns are described on the Map of Ptolemaios in the 2nd century, e.g. Coridorgis for Jihlava. Those tribes migrated to the West in 5th century and then came Slavs. The first Slavic people (Czech tribes in Bohemia and Moravians in Moravia) arrived in the 6th century. According to historian Dušan Třeštík, they advanced through the Moravian Gate (Moravská brána) valley and in the year 530 moved into Eastern Bohemia, along the rivers Labe (Elbe) and Vltava (Moldau) further into Central Bohemia. Many historians support the theory of a further wave of Slavs coming from the south during the first half of the 7th century. They fought with neighboring Avars until the rise of the empire of Samo (see below). According to the Chronicle of Fredegar, some of the Slavs living on what is now Czech territory, mainly in southern Moravia, were exposed for a number of years to violence and marauding raids from the Avars, whose empire stretched across the territory of present-day Hungary. In 623, the Slavic tribes revolted against the oppression of the Avars. During this time, the Frankish merchant Samo allegedly came to the Czech lands with his entourage and joined with the Slavs to defeat the Avars. Thus the Slavs adopted Samo as their ruler. "So it happened that he self-founded the first Slavic empire. He married the then twelve Slavic women had with them twenty-two sons and fifteen daughters and happily ruled for 35 years. All other fights, which under his leadership Slavs fought with the Avars, were victorious," the Frankish chronicler Reich (called Fredegar) wrote about Samo in the oldest extant written report by the Slavs in the Czech lands. Later Samo and the Slavs came into conflict with the Frankish empire whose ruler Dagobert I wanted to extend his rule to the east, but Dagobert was defeated in the memorable battle of Wogastisburg in 631. To this day, historians are searching in vain for this stronghold's actual location. Over the next five years Samo and the Slavs undertook raids on Frankish territory, but no one knows exactly how far to the northeast Samo's power eventually reached, probably beyond the boundaries of today's Czech Republic. After Samo's death, his empire seems to have disappeared; in fact, however, there never was a real state structure with solid organization. The empire was created to unite Slavs to defend against Avars and Franks and to facilitate Slavic plundering expeditions against their neighbors. Once the Avar and Frankish danger had passed, the united empire disintegrated and the fragmented territories were ruled by Samo's various followers. These remnants continued their further development and became the core foundation for the future Great Moravian Empire. A Slavic state Great Moravia was created by the ancestors of the Czechs, Slovaks and Poles and its core area lay on both sides of the Morava river. 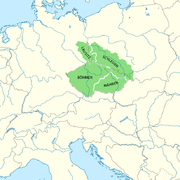 The Duchy of Bohemia established in the 9th century raised to a Kingdom in 1198. The country reached its greatest territorial extent and is considered as the Golden Age. Ferdinand II, who ruled 1619–1637, sharply curtailed the power of the largely Protestant representative assembly known as the "Bohemian Estates". He confiscated lands of Protestant nobles and gave them to his Catholic friends and to the generals who led the foreign mercenaries he employed. 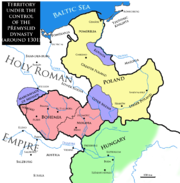 The Kingdom of Bohemia officially ceased to exist in 1918 when the Czecho-Slovak Republic was declared, a merger of the lands of the Bohemian Crown, Slovakia, and Carpathian Ruthenia. Czechoslovakia before WW2 remained the only democracy in central and eastern Europe. The large German population of the Czech lands was expelled after fall of Nazi Germany and of its occupation of Czechoslovakia. The Czechoslovaks were now almost homogenous in their composition, dominated by ethnic Czechs and Slovaks. On 1 January 1993, the Velvet Divorce occurred, whereby two separate states were created out of the former Czechoslovakia: the Czech Republic and the Slovak Republic. The Czech Republic became a member of NATO in 1999, and the European Union in May 2004. ^ "Boii | people". Encyclopedia Britannica. Retrieved 2019-03-14. ^ "Czechoslovak history". Encyclopedia Britannica. Retrieved 2019-03-14. ^ ; Literature : Dušan Třeštík: "Počátky Přemyslovců. Vstup Čechů do dějin (530-935)" [The beginnings of Přemyslids. The entrance of the Czechs in the History (530-935)], 1997, ISBN 80-7106-138-7. ^ John P. McKay (2010). A History of World Societies. Macmillan. p. 473. Wikimedia Commons has media related to History of the Czech Republic. c ČSR; included the autonomous regions of Slovakia and Subcarpathian Ruthenia. e ČSR; declared a "people's democracy" (without a formal name change) under the Ninth-of-May Constitution following the 1948 coup. This page was last edited on 30 March 2019, at 15:41 (UTC).